How does a company shed its image as a stodgy, static place for business types? This has been LinkedIn’s perennial challenge. The self-proclaimed “professional network” has long been seen as a landing page for your business life; perhaps you’ll visit your LinkedIn page when you want to update your resume, but for little else. The goal: Stop making it look like a repository for resumes, and start making it look like a true social network. The company is in the midst of a complete consumer-facing revamp of its products, from its desktop experience to the multiple apps now available for mobile devices; on Wednesday morning, LinkedIn introduced multiple redesigned apps and new products at an event in San Francisco. “We have to mobilize our entire company so that we can meet the demands of our members,” SVP of products and user experience Deep Nishar said at the event. Take, for example, the company’s new iPad app. In the biggest overhaul since its 2012 debut, the new app hosts splayed-out photos, iPad-tailored navigation controls, and better search functionality. The stream is also people-centric, showing the latest interactions and updates from those within your network. Or take the redesign of Pulse, the news-aggregation application LinkedIn acquired earlier this year for $90 million. It’s a streaming feed of content, culled from the social and news streams that you follow on a regular basis. It’s easily LinkedIn’s biggest content-focused play yet, in line with the introduction of its “Influencer” publishing program that streams more content throughout its network. 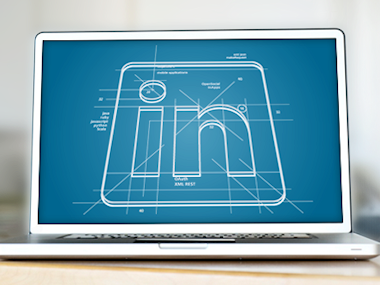 Perhaps the biggest deal is Intro, the new product LinkedIn rolled out at Wednesday’s event. It’s essentially a plugin that integrates with your iOS email application, sticking LinkedIn profile information into emails you’ve received from others. It’s LinkedIn’s boldest move to date to move outside of its siloed apps and website, and into the consumer inbox, the place where many spend up to a third of their working day (according to LinkedIn’s data). The redesigns, combined with LinkedIn’s suite of separate mobile apps, represent the company’s latest major moves to convince consumers that it’s not just a holding place for their work identity, updated only when they’re thinking of changing jobs. You’re prompted to give comments and feedback via built-in social interaction tools. You can “follow” certain top personalities — sort of like Twitter — and watch their articles flow through your stream. You’re basically given multiple pathways into the LinkedIn world, and encouraged to stay as long as possible. The question is, do people want to spend that much time in a “professional network,” even if it does look a whole lot more like a consumer platform? Personally, I can only read so many articles on leadership and business before I get burnt out, and some of LinkedIn’s engagement tools — like endorsements, for example — feel half-baked at best. But I imagine that more types of content offerings, visual rethinks and perhaps even more single-serving apps and actions are in the works. And as product managers like Nishar and others said at Wednesday’s event, it’ll be an iterative process, with multiple product updates coming throughout the year. We’ll see, then, if folks want another network to spend time on — whatever it looks like.